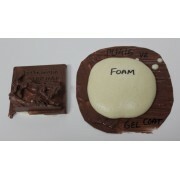 PU416 Gel Coat Paste This is a PU based gel coat / paste use to provide a tough and semi-flexible skin on PU foam components. Used in the furniture industry. Quick setting. Backing foam can be applied in 15 minutes or less. Thixotropic - easy to apply. Bonds easily to the foam backing..